When Brunel designed the Great Western Railway he wanted to make it the flattest, straightest line he could. He achieved most of the 188 mile route with either level or had gradients no steeper than 1 in 1000. Reaching Swindon is at the highest point, and the line than falls to Bath includes Box tunnel, which is at a steeper gradient: 1 in 100. For many years, railway enthusiasts and mathematicians have argued over whether Isambard Kingdom Brunel, the creator of the Great Western mainline, did design the two-mile tunnel with his own birthday in mind. It is believed that Brunel deliberately designed the two mile-long Box Tunnel so that every year on his birthday the rising sun would shine directly through from one end to the other, creating an astonishing effect. On April 09th 2017– 211 years after Brunel’s birth – the line was shut because of upgrade work to electrify the Great Western line, providing Great Western Railway and Network Rail with a rare chance to observe whether the sun really does shine through the length of the tunnel. Communications manager Paul Gentleman, who was at the eastern end, said he was treated to a spectacular sight. “When you look from the east portal, the cutting provides a lovely V-shape,” he said. 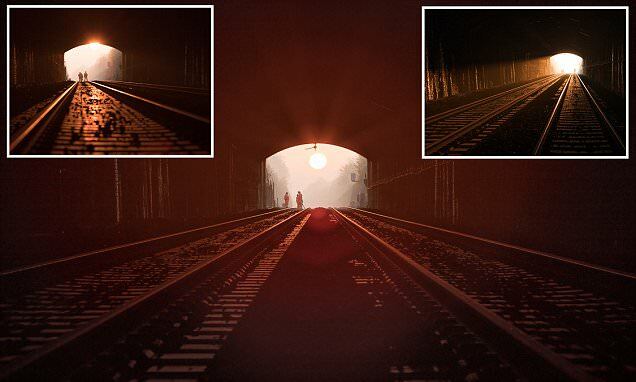 “The sun rose from the left and was shining directly down the tunnel. We couldn’t see how far. The supposed link with Brunel’s birthday was first reported by the Devizes Gazette in 1842. The Daily Telegraph followed the story up some time later but, until now, as far as GWR knows, there have been no photographs of the supposed phenomenon. Digging the tunnel through the solid Bath stone was a formidable task. Using only candles to see by, 1500 men (rising to 4000 as the tunnel neared completion) toiled day and night. Each week a ton of gunpowder and a ton of candles were used up. Work continued twenty-four hours a day. Construction began in 1836, and the tunnel opened in 1841. In those five years, the lives of more than 100 navvies were lost. Working from both directions, the calculations Brunel made were so accurate that when the two ends of the tunnel were joined underground there was found to be less than 5 cm (2 in) error in their alignment. It was, when completed, the longest railway tunnel in the world, at almost 2.9 kilometres (1¾ miles). And, more than 160 years later, it remains in daily use as the high speed train route from Bristol to London. Did Brunel design the Box Tunnel so light would shine on his birthday? British engineer Isambard Kingdom Brunel designed the Box Tunnel, which runs from Chippenham to Bath, as part of the Great Western Railway. The tunnel is 1.83 miles (three km) long. Box Tunnel is a railway tunnel in Western England, between Bath and Chippenham, dug through Box Hill, and is a significant structure on the Great Western Main Line (GWML). It was built between 1838-1841 for the Great Western Railway (GWR) under the direction of the railway’s engineer Isambard Kingdom Brunel.